This week marks the six-week countdown to my first marathon, the San Francisco Marathon, which I’ll be running with my sister at the end of July. I’m nervous but I know we can do it well! Training for a marathon involves, as you might have guessed, lots of running. Sometimes these are long, slow runs and sometimes they’re shorter, faster, hillier runs. Either way, I need to make sure I’m fueled up well every time I go out. For shorter runs, a burst of quick sugars can help. But for longer runs, it’s best to have a combination of fast sugars, protein, and fat. 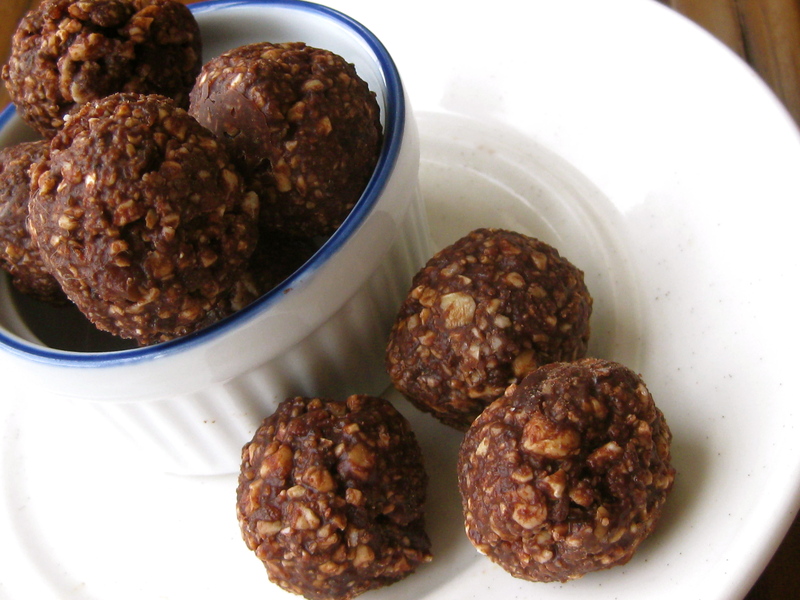 These energy bites are the perfect solution for a long run! The nuts provide protein for muscle repair; the coconut oil provides fat for satiety and recovery; and the dates provide carbohydrates that are quickly digested and ready to burn for energy. Plus, they are loaded with vitamins, minerals, antioxidants, healthy fats, and pure deliciousness. 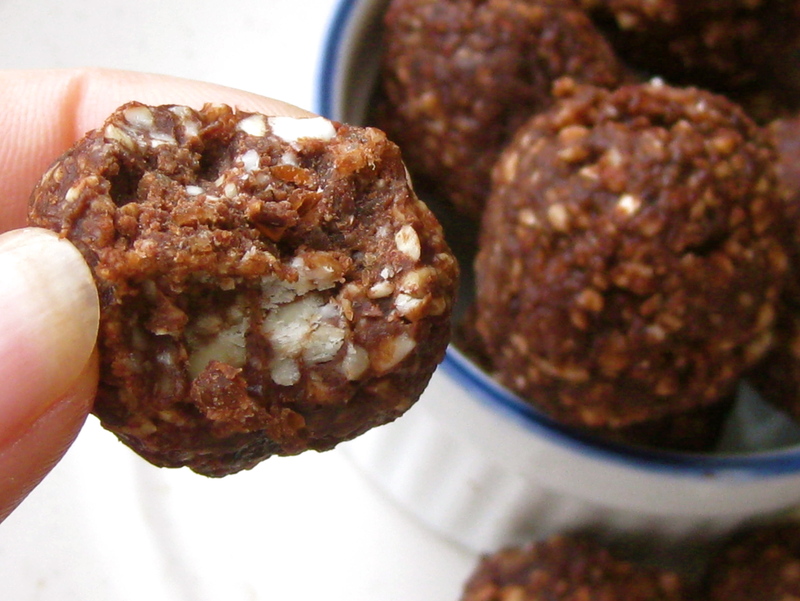 There’s no need to buy pre-made, processed, or packaged energy bars when you can make tasty treats like these. They’re easy, fast, and exactly what you need to get you through a long distance. Stick ’em in your pack the next time you head out on a long run and enjoy their pure, natural goodness. Optional first step: soak the cashews for 3-6 hours. Drain and rinse the cashews. Blend all ingredients in a food processor until well-mixed. Freeze for 15 minutes. Store in the refrigerator until ready to eat. Enjoy! If you run long distances, do you have a favorite snack for long runs? Hi Andrea! I am going to have to make these. The owner of my gym has asked me to incorporate some sugar-free recipes for his clients on my blog. He also asked for something that was easy to whip up and these totally fit the bill. I am going to make these this weekend to take on my trip as they sound like an easy pick me up. Did you use refined or unrefined coconut oil? Do you have any other yummy sugar-free recipes? Hi Jackie! That’s great! These are really yummy. I hope you like ’em! I used refined coconut oil for the ones in this pic but have used unrefined in other bars/bites. Either works. I have a whole bunch of no-sugar-added recipes if you click on the “Recipes” link at the top of the page. I say no sugar added instead of sugar-free because of the natural fruit sugars, though, just FYI 🙂 Hope you are well!! Thanks Andrea! I will check out your other recipes and let you know how these turn out when I make them. Do you have any favorites that you think I should try first? These look delicious! Would love to pop a couple of these in a ziplock and take them along in my bike jersey! Are you on Twitter? I tweeted that one but couldn’t find an @ for you. I may have missed it; I’m a new Tweeter!! Yes! I’m @andreadrugay 🙂 You? 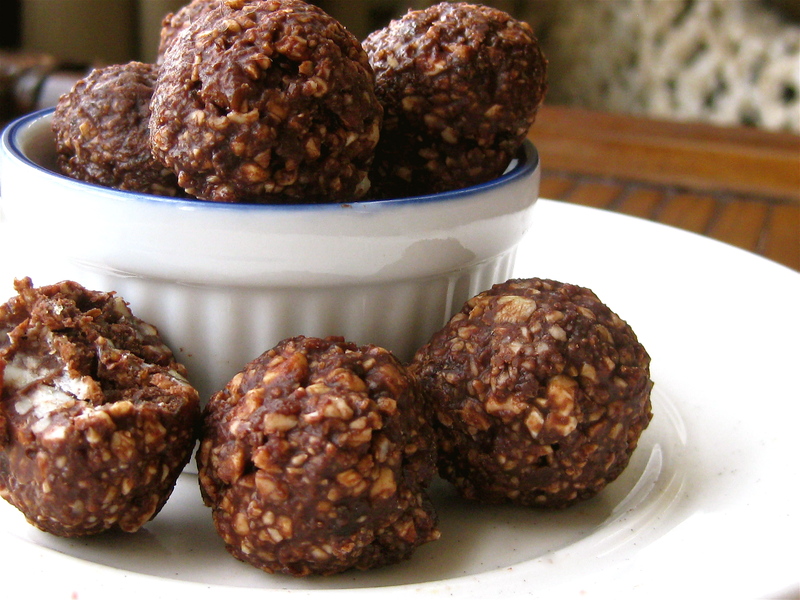 This looks fantastic- I love date based treats and when you add in cashews, coconut and chocolate, I’m in heaven! I completely agree. So delish! Look great… be nice with figs to I bet!